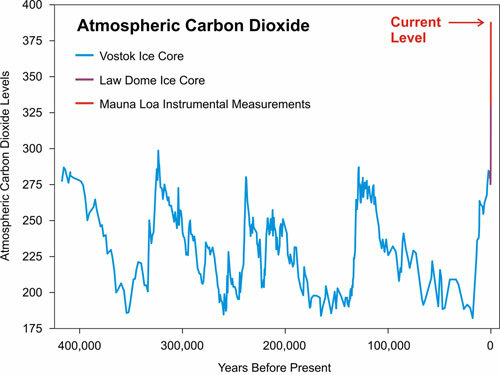 Geologists, especially those, like me, of a certain age, often have problems with climate science and the idea that humans may be triggering a massive and abrupt change in the climate. Global change, we were taught, occurred slowly and by commonplace mechanisms: sediment carried by water, deposited a grain at a time: erosion effected by water and wind, the hardest rocks slowly ground down crystal by crystal. The great features of the Earth—the canyons, mountains and basins—were built this way and owe their grandeur to Deep Time, geology’s greatest intellectual gift to human culture. In the face of the history of the natural world, geologists feel a certain humility at the insignificance of humans and our tiny lifespans. But we also feel some pride in the role of our subject in piecing together this history from fossils and outcrops of rock. It’s an amazing detective story: diligent scientists patiently working away and uncovering the Earth’s great secrets. Then climate science comes along and grabs all the headlines. Suddenly, we hear, change is coming fast and the outcome could be ugly. The familiar music of natural geological change is about to be disrupted by a noisy interruption in the form of human intervention. To add insult to injury, many of the people delivering this disruptive message do not seem—at least to some geologists—to be sufficiently deferential to the extensive knowledge about the slow and cyclic changes in the geological past. This is quite false, as I found out for myself. My initial reaction many years ago to hearing about climate change was one of disbelief, mixed with a strong suspicion that the climate forecasters had neglected to take the lessons of Earth history into account. I soon found out that I was completely wrong about this. I confess also, as I read the scientific literature, that I learned more about modern geology than I had in many years working as an industrial geoscientist. Unknown to me, immersed in my own areas of specialty, geology had moved on, especially in palaeoclimatology.